It is a truth universally acknowledged that family holidays just – well – flow that much better when the kids have water to splash and swim in. These stunning pools will impress and delight all in the family. 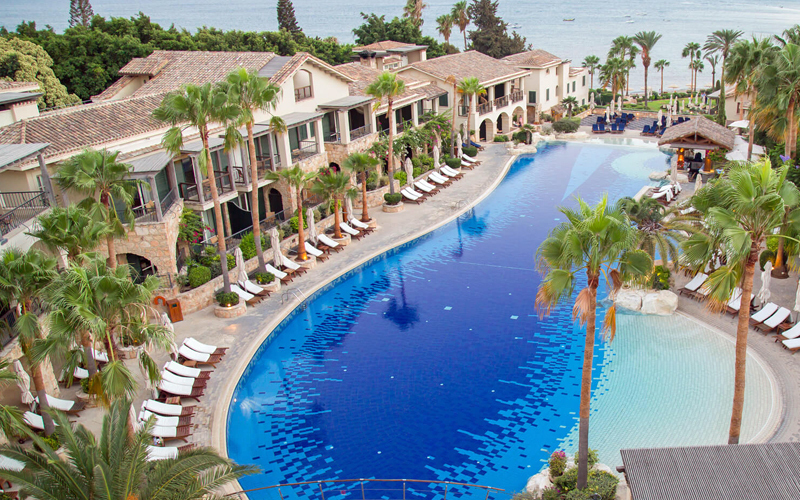 At welcoming all-suite Columbia Beach Resort on the ever-sunny southern shores of Cyprus, the swimming pools come in sizes big and ginormous. Each has a crescent-shaped toddler splash pool at one end, plus a bar to keep all hydrated. The gargantuan one comes in lagoon style and connects into the spa area so you can enjoy 80-metre laps; the merely large pool tends to attract the families. While you’re here: try watersports on the beach below; head to the excellent spa; enjoy the kids club. 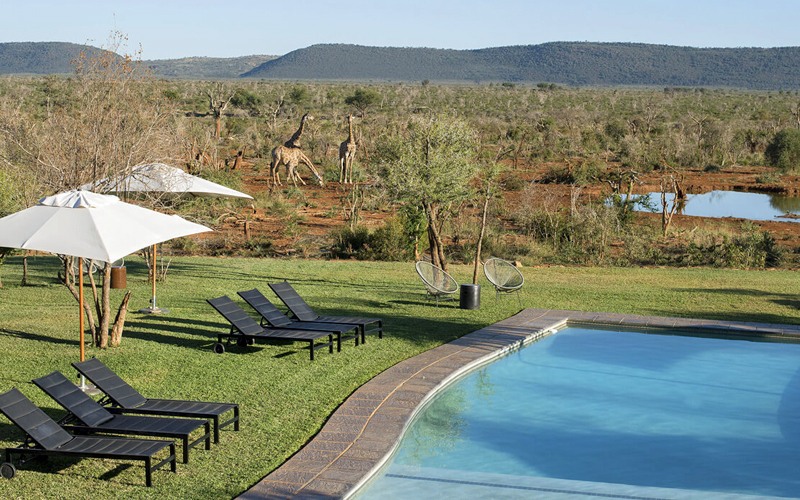 Yes, at stellar Madikwe Safari Lodge, which is found in a malaria-free Big Five South African reserve, you can lounge in the pool while watching elephant, giraffe and zebra drinking at the waterhole. Of course, you can also head out on safari (for those with small fry the family drives ensure you get your own vehicle) for more wildlife, and they arrange bush orientation and dung tracking for kids. Each room comes with a plunge pool, too. While you’re here: the Eco House has live creatures including scorpions and tarantulas; the kids club has rock painting and scavenger hunts; the stargazing is magnificent. Porto, Portugal’s second city, has a great setting on the banks of the mighty Douro River. 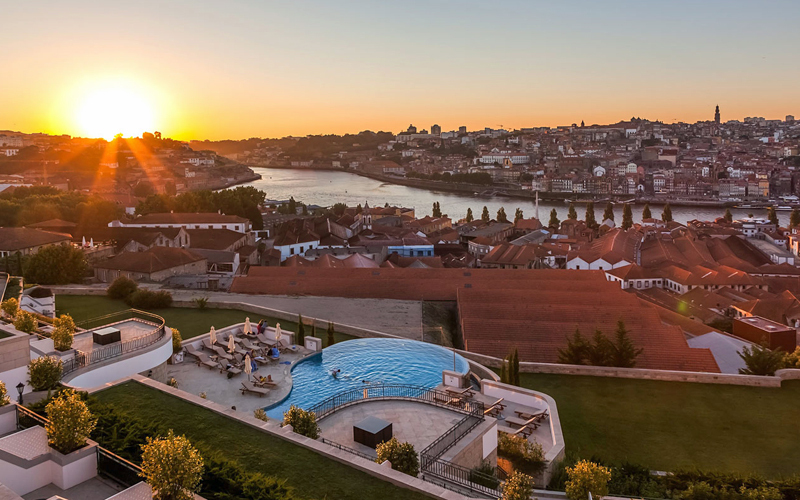 Luxurious wine and spa hotel The Yeatman has an enviable position high above the famed port lodges overlooking UNESCO-listed medieval rooftops opposite, and its fabulous decanter-shaped infinity pool (a mere 145m2) is possibly the best place to soak in the iconic views. There’s also an 80m2 heated pool in the spa to which children have full access. While you’re here: take a boat trip down the Douro; there’s a kids clubroom stuffed with toys and games; book a suite where the bed is in a wine barrel and then book a babysitter and dine in the aptly named (2 Michelin-starred) Gourmet Restaurant. This is a great way to learn geography! 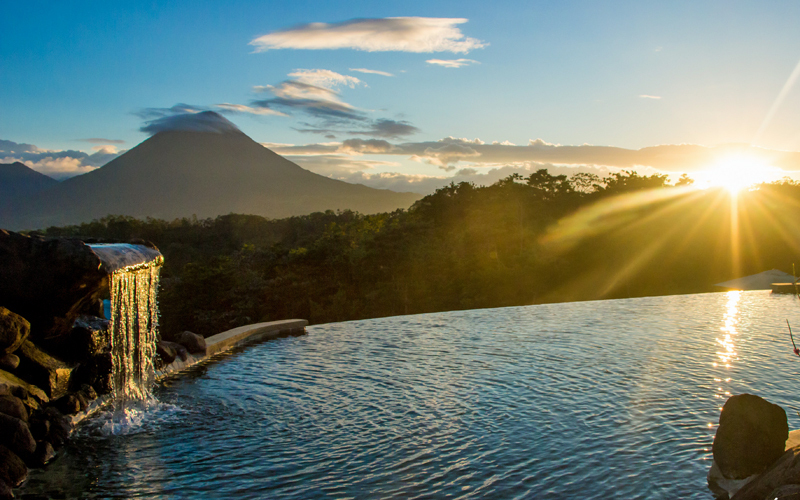 Frolic in the infinity pool at family-friendly Costa Rican working farm Leaves and Lizards for a tremendous view of active Arenal Volcano. If your budding volcanologist wants to get closer to the action you can do a sunset hike through primary rainforest in the Arenal Volcano National Park and watch red lava spurting as darkness falls. While you’re here: learn to be a cowboy and enjoy Costa Rican rodeo; collect eggs and milk cows; the birding is brilliant; adrenaline sports nearby include white water rafting, caving, zip-lining and canyoning. 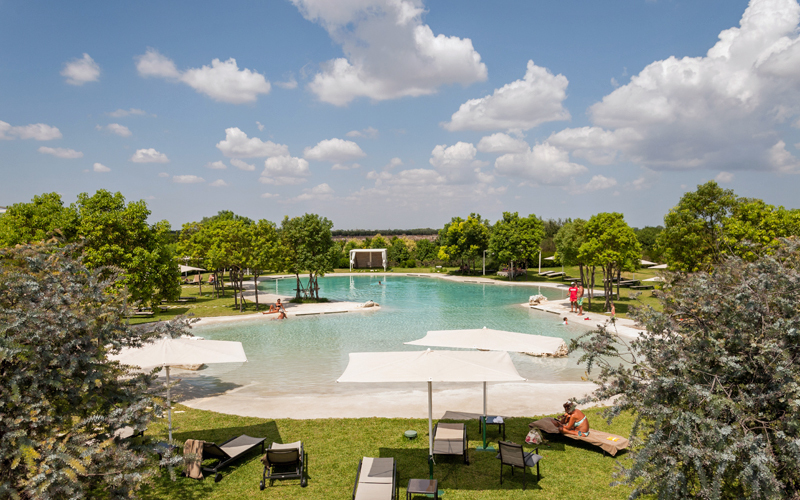 Head to wonderful Puglia and to this contemporary hotel on a fig plantation for sheer country delight. Purpose-built Furnirussi Tenuta comes with light, spacious rooms and big gardens with large lawns. Its star attraction is the very special 1000m2 lake-style pool lined with ground marble so it’s smooth underfoot, which has a gently shelving end for children, plus rock-like islands for basking and playing. While you’re here: sandy beaches are close by, they have a deal with a family-friendly beach club (and arrange a shuttle bus in high season); big gardens with large lawns. For truly spoiling family time, Fusion Maia delivers. 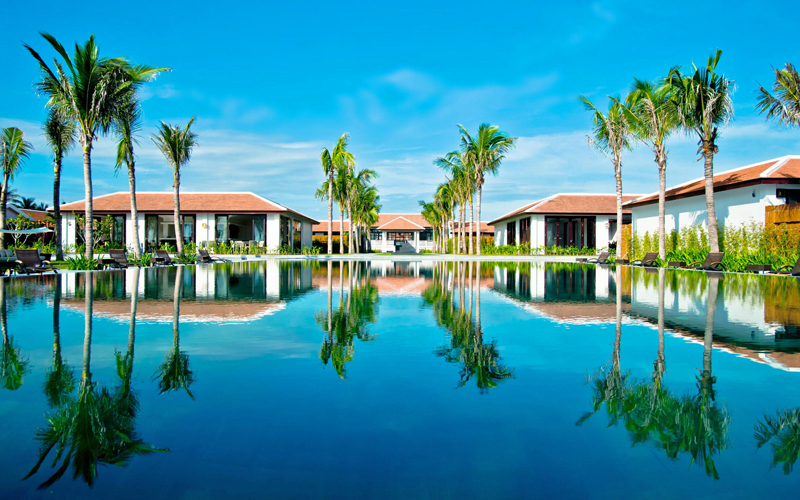 This stunning Vietnamese hotel is set on a dreamy strip of white sandy beach, only 20 minutes from popular Hoi An, and has an oversized infinity pool which has a great view and is designed for families. (There’s another large pool plus Jacuzzi in the spa’s garden, which is for adults only). In addition, each room has its own plunge pool. While you’re here: the mini Maia kids spa & activity centre has activities from lantern and conical hat decorating to mini treatments such as massages and pedicures, while adults enjoy the superlative spa. You haven’t really done Iceland unless you’ve seen tumbling waterfalls, breathtaking glaciers and ice caves, and swum in a naturally heated pool. Well happily you can do all of these (and more) while at Hotel Husafell in the country’s wild west. 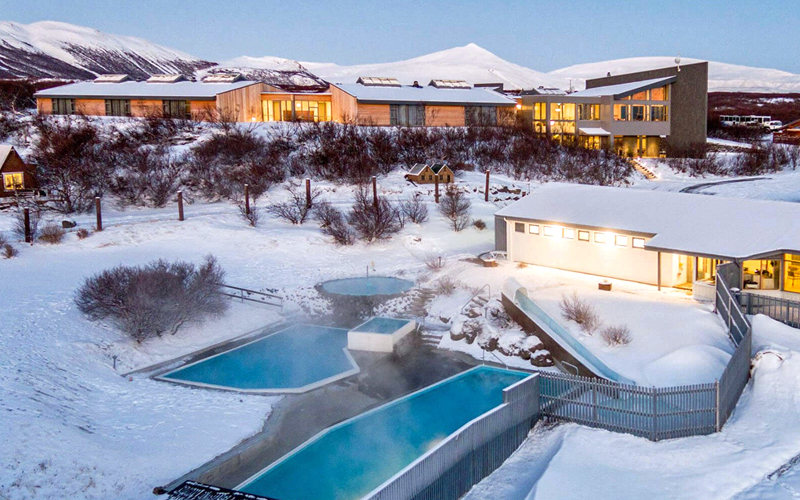 Their two alfresco geothermal pools come with a waterslide plus a pair of hot tubs for Northern Lights-gazing. While you’re here: try snowmobiling; ride Icelandic ponies; visit one of the largest lava caves in the world. 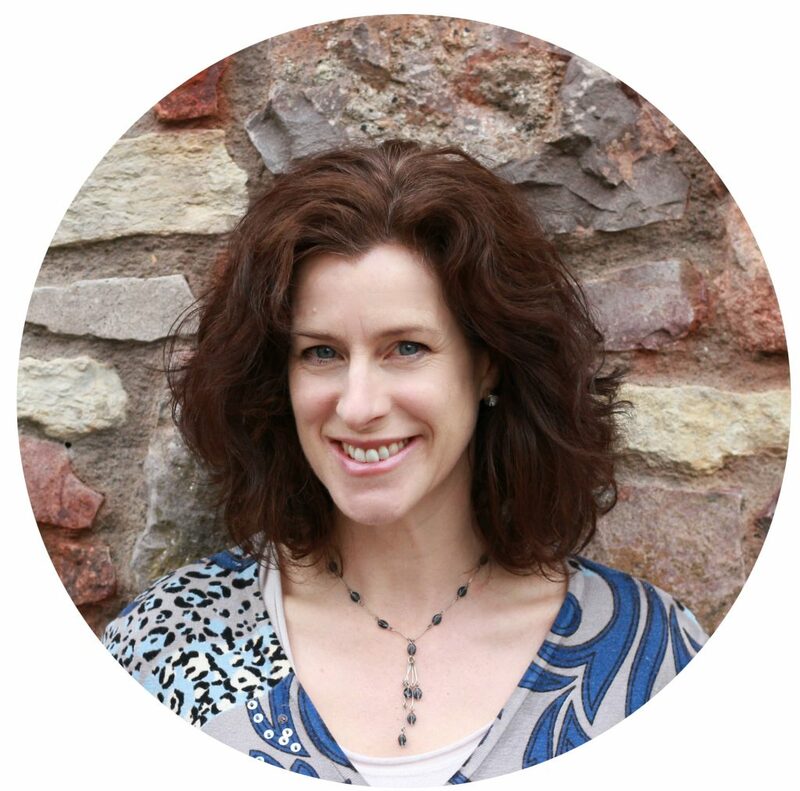 Let’s face it, holidaying in the British Isles often comes with a weather warning, so book somewhere with an indoor heated swimming pool for when getting outside isn’t a great option, and the kids just need to expend energy. 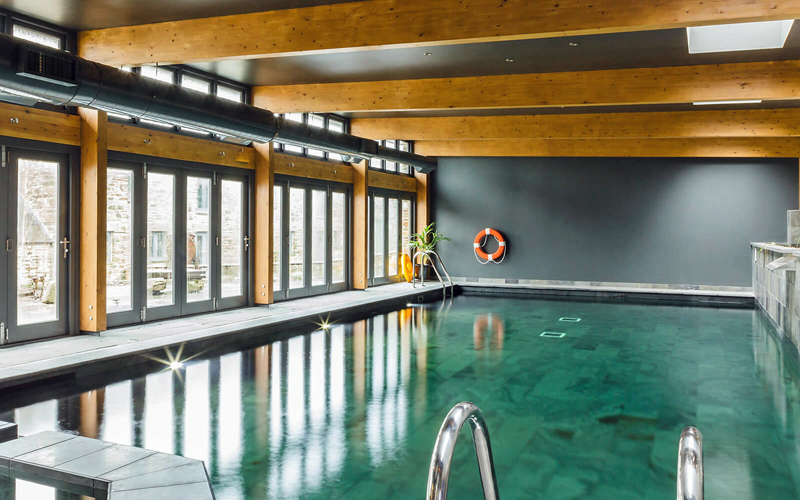 Show-stopping eco-luxe restored Cornish barn Tregulland has a 12x5m indoor freshwater pool plus a steam room and an outdoor wood-fired hot tub, and a separate pool for little ones. While you’re here: enjoy the home cinema and games room; an imaginative playground featuring a pirate boat; nearby beaches for surfing and fishing; adventure park. There are endless pristine beaches in beautiful Brazil, many backed by pristine rainforest and swaying coconut palms. 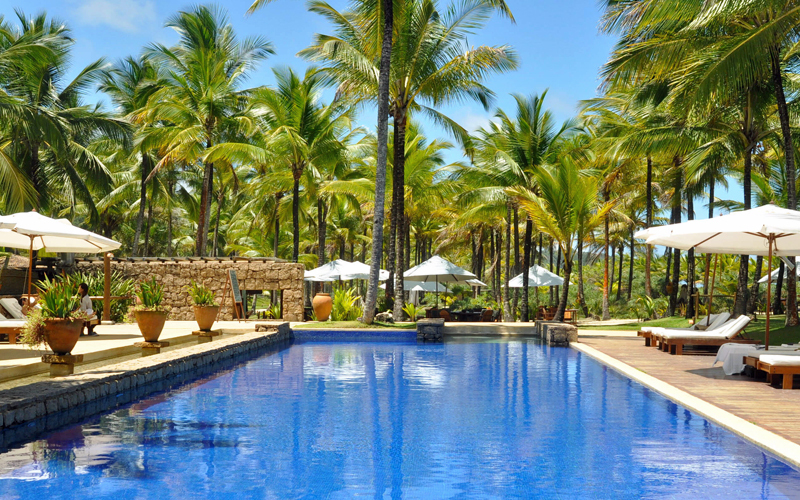 We reckon best experienced at exceptional idyllic Txai Resort in heavenly Bahia. 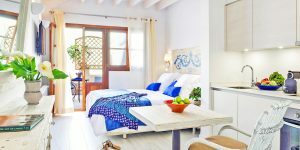 Among its attributes – a hill-top spa, fresh Bahian cuisine, elegant thatched rooms – are three cobalt-blue-tiled heated swimming pools (including a kids pool) which are steps from an outstanding beach. While you’re here: take an eco-trip to forest waterfalls; river rafting and horse riding; birdwatch from your balcony; Sea Turtle Project; cocoa farm tours; luxuriating in that incredible empty beach.